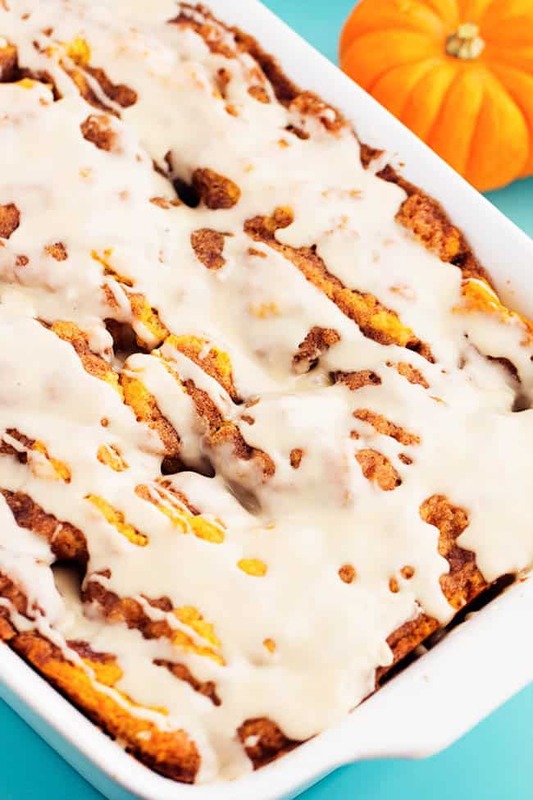 This Pumpkin Cinnamon Roll Cake tastes just like you are eating a cinnamon roll! 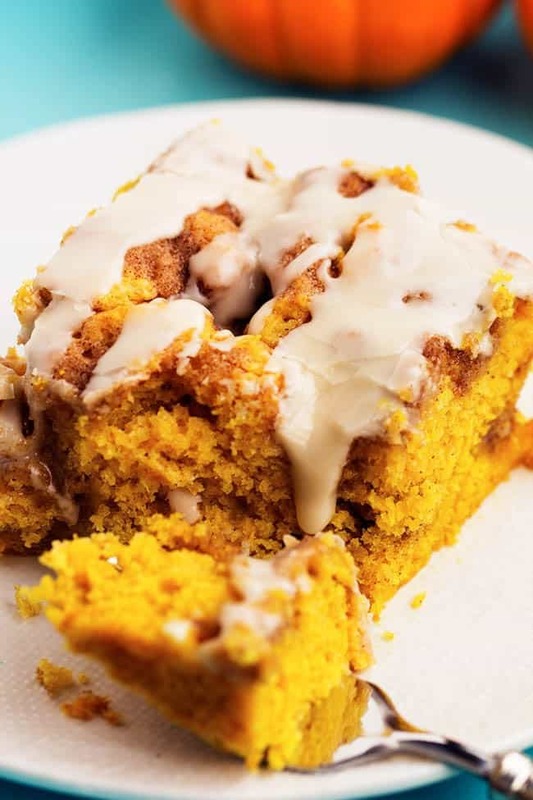 A perfectly moist pumpkin cake with pockets of swirled cinnamon and brown sugar topped with a maple glaze. This is one of the best fall cakes! The weather has been cold and rainy here and it is starting to feel more and more like fall. I love this time of year. We live in a neighborhood with huge tree lined streets. I love watching the leaves change and it is absolutely gorgeous. I especially love cozying up inside with a sweatshirt on and a blanket and eating a delicious pumpkin dessert. This is my first pumpkin recipe this year. And let me tell you. It might be the best pumpkin related dessert that I will ever have. We love this Cinnamon Roll Cake on the blog. It was one of the very first recipes on here. Who wouldn’t love all of the goodness of an ooey gooey cinnamon roll in a cake? So the thought came to me late one night. 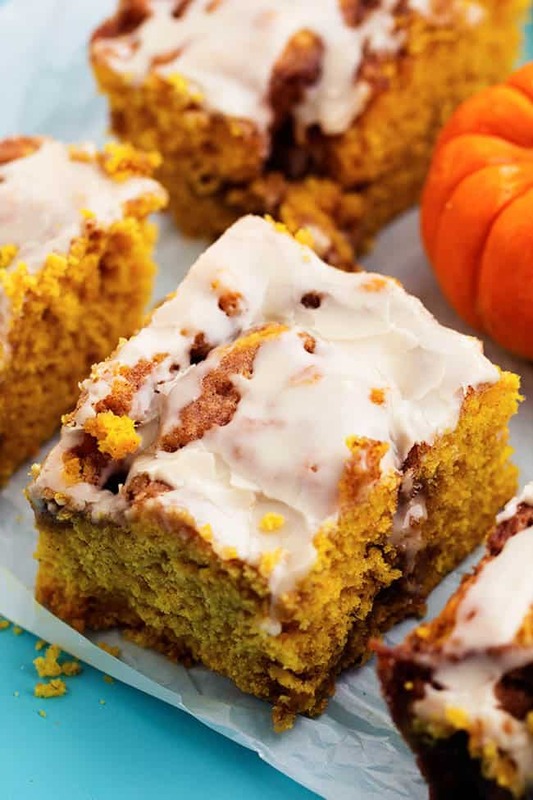 Why don’t I make our favorite cinnamon roll cake into a pumpkin cinnamon roll cake? So I did. And our minds were all blown. This is the kind of cake that you can’t get enough of and secretly lock yourself in your closet to eat it. 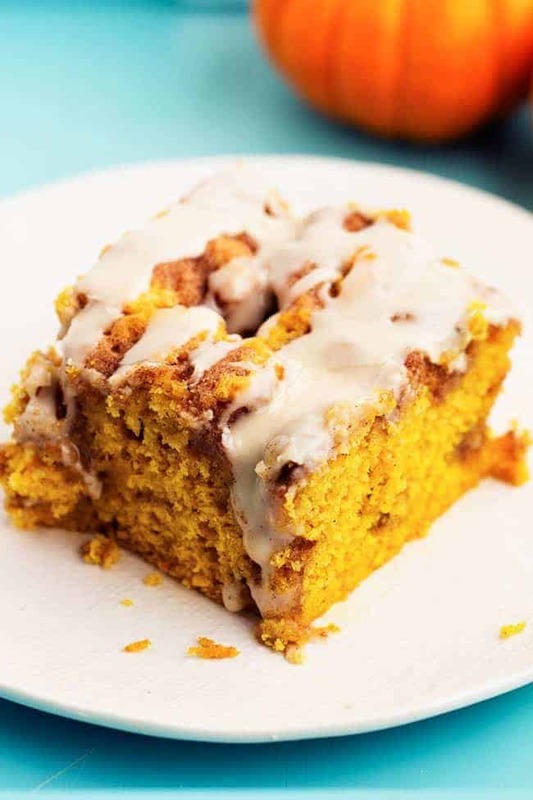 It starts with a perfect pumpkin cake. This cake is so moist and delicious. But the brown sugar cinnamon mixture swirled throughout it the BEST!! It creates these pockets throughout the cake. THEN you drizzle it in a maple glaze and that seeps down into these pockets. It tastes just like a cinnamon roll in cake form and is one of the best things that I will EVER have. You will not regret making this cake. You will make it again and again! It is amazing! Preheat oven to 350 degrees. Grease a 9x13 inch pan and set aside. In a large bowl combine flour, salt, sugar, baking powder, cinnamon and nutmeg. In a medium bowl whisk eggs, milk, pumpkin, and vanilla. Slowly stir in melted butter. Combine to the flour mixture and mix until combined. It will be stiff. Spread evenly into prepared pan. To make the cinnamon sugar topping: In a medium bowl combine the butter, brown sugar, flour, and cinnamon. Drop by tablespoons over the cake and swirl with a knife. Bake at 350 degrees for 25-30 minutes or until toothpick comes out nearly clean from center. Place powdered sugar, maple syrup, milk, and vanilla in a large bowl. Whisk until smooth. Drizzle over warm cake. Serve warm or at room temperature. This cake looks amazing! My cinnamon buns usually come with cream cheese icing but I’m loving the idea of the maple icing glaze. My family would totally love this. Let the pumpkin eating fun begin!! Hi Alyssa. This looks delicious. I do have one question: The recipe says pumpkin pie filling. Is that canned pumpkin? I ask because most recipes call for canned pumpkin and not the filling. Have a beautiful day! Thanks for the recipe!! Looks so good, I cannot wait to try it! October is already booked solid with social gatherings, I think this will be the recipe I’ll make!! Thank you for the Yumm!! I had a bit of pumpkin left from another dessert and decided to give this a try. It was only the pumpkin purée not pumpkin pie filling. It turned out really good! I added pumpkin pie spice 2 t.into the cake batter and just the one t. of cinnamon as stated in the recipe. It was moist and tasty! We had it with cinnamon ice cream. Wow! This will be on our fall menu again! Thank you for sharing. This has my taste buds jumping for joy!! Can this recipe be made smaller and baked in a smaller pan? Has anyone done that? Hopefully someone has experience and can advise me……thanks for your help.